Few places can capture the imagination in quite the same way as Moab, Utah. Just minutes from two national parks—Arches and Canyonlands—the Colorado River, and countless square miles of public land, Moab is surrounded by a vast playground for adventurers of all stripes. In addition to its opportunities for hiking, climbing, and paddling, Moab is a mountain biker’s paradise. Moab’s mountain biking history dates back to the 1980s, when the town’s uranium mining boom days had come to a close. Moab’s Rim Cyclery opened in 1983, and soon, brothers Robin and Bill Groff were stocking the Specialized “Stumpjumper,” a predecessor of the modern-day mountain bike. 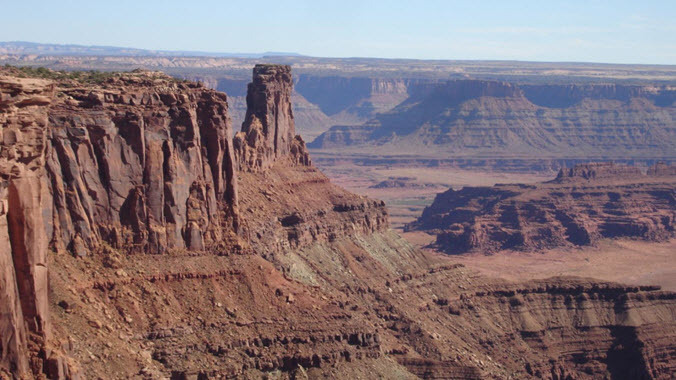 The Slickrock bike trail, then used for motorized sports, was soon being used to try out modified versions of the mountain bike, and on Halloween in 1986, the first Canyonlands Fat Tire Festival was held. Within a few years, bike shops and new trails began popping up, and at the end of 1999, Moab Trail Mix was launched. This county-sponsored advisory committee began working up plans for non-motorized trails in the Moab area in conjunction with local land managers like the Bureau of Land Management and the US Forest Service, in developing some of Moab’s best-loved mountain bike trails. 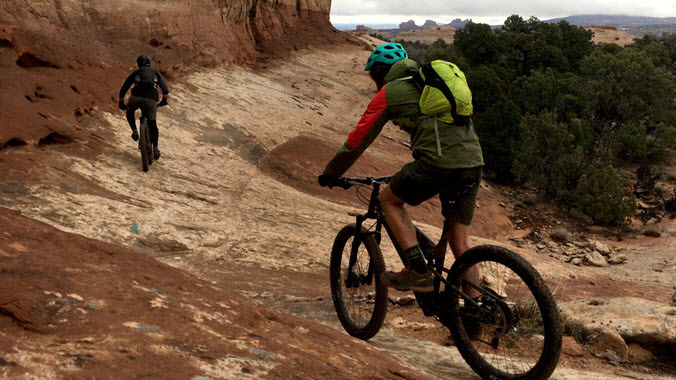 These days, whether you’re a serious pedal masher or a newbie, there’s something for you to ride (and have the time of your life) in Moab. Trails in the area can be ridden year-round, though thanks to the high desert climate, riding in the summer months is best done in the early morning, before temperatures soar into the 90s. 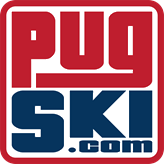 If you don’t own a bike (or want to demo something a little higher-end), consider renting from a local shop, where knowledgeable staff can help you pick the best rig, sell maps of popular local trail systems to benefit local MTB organizations, and point you to trails appropriate for your skill level. Brand Trails: Also known as the Bar M trails, Brand Trails is home to more than 30 miles of mountain bike trails, much of it in the beginner-to-intermediate realm. The eight mile Bar M Loop, which includes 4WD road, doubletrack, and some slickrock, is an ideal introduction to the area and boasts views of the La Sal Mountains and Arches National Park. Klonzo Trails: Much of the Klonzo system, which borders Arches National Park, is rated beginner-intermediate. There are several interconnected loops here, so it’s easy to pick beginner-friendly trails at well-marked junctions and decide whether to keep pedaling or head back to the trailhead. Horsethief Area: Opened in 2015, the Horsethief Area trails total around 20 miles of singletrack, much of it beginner-to-intermediate. 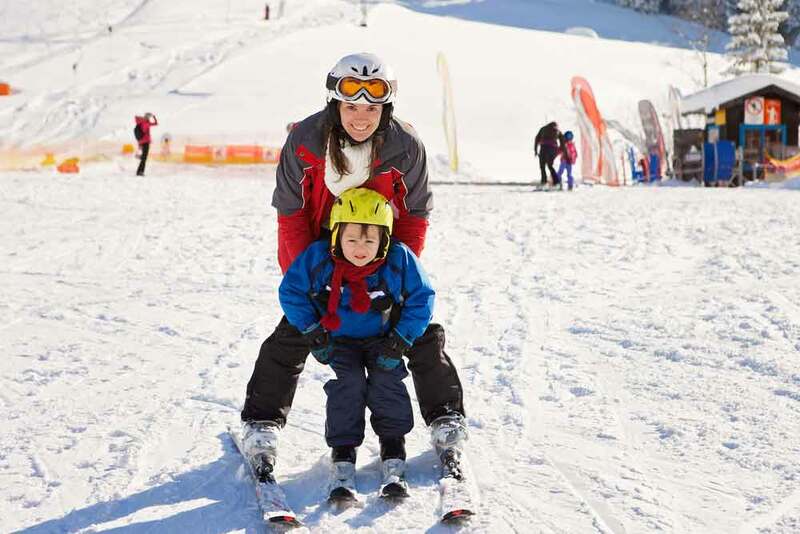 At just under a mile, the Wrangler Trail offers a great warmup for new riders, who can gain some confidence before moving on to the Whirlwind or Mustang Loops. The Intrepid Trail system, completed in 2014, can be ridden as a loop and boasts phenomenal views of canyon country. S/V Windom. Intrepid Trail System: This excellent trail system in Dead Horse Point State Park is best ridden counter-clockwise in a 14-mile loop. The loop affords fantastic views and ramps up in difficulty, so by the time you’re getting to the end, you’re ready for tougher features. If you’re going to do one intermediate loop in Moab, this should be it. Navajo Rocks: Bad weather? Don’t pack it in yet. Amazingly, this ride is actually better if it has just rained, thanks to the sticky sand features. For the most bang for your buck, set a shuttle so you can start at a pullout just above Big Lonely and ride that, Big Mesa, then either Ramblin’ or Rocky Tops back to your car. Magnificent 7: This area gives an idea of Moab’s mountain biking history, with lots of ledges and rugged double-track. Today, intermediate riders will revel in the southern end of the Mag 7 system. Bull Run and Getaway, among others, are suitable for mid-level riders. The Slickrock Trail isn’t for the faint of heart. The five-mile warmup loop will give you an idea of whether you’re ready to commit to the whole thing. Zach Dischner. Amasa Back Area: With trails named “Captain Ahab” and “Rockstacker,” you know Amasa Back has some serious black diamond (and double-black) rides. Trails here feature super-technical ascents and descents, big drops and ledges, and a chance to do some free-form slickrock riding. Good news: It’ll be hard to tell if you’re out of breath from the riding or the views. Slickrock Loop: This is a must-ride Moab classic. At just under 11 miles, Slickrock packs in some seriously advanced elements, including slabby traverses you’d normally think of doing in rock shoes. The vast majority of the ride is on slickrock, so it’s a totally unique experience. Not sure if you’re ready? Check out the 1.6-mile practice loop to test your mettle before committing. The Whole Enchilada: This world-class ride requires a shuttle and some serious fitness. Start at Burro Pass, at over 11,000 feet elevation, and ride 34 miles to the Colorado River. The ride descents more than 7,000 feet and is considered one of the best (and toughest) rides in the area. Consider doing Porcupine Rim to test your legs before taking on the Whole Enchilada.